Dengue Fever, A Tropical Disease, Buzzes Back Into U.S. Seven decades after public health officials thought they'd eradicated dengue fever, the disease has once again become a scourge in Florida. More than 90 cases have been reported there since 2009. The stakes are high: The same mosquito that carries dengue is also a vector for yellow fever. 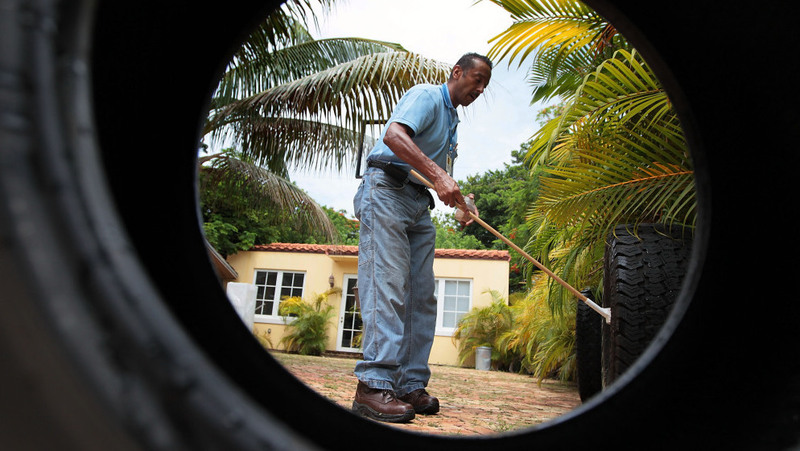 Lawrence Smart of Miami-Dade Mosquito Control looks for mosquito larvae in vehicle tires where water has collected, July 2010. Tropical diseases like dengue fever sound as if they belong in faraway places. But in the past several years, some have begun showing up in the continental U.S.
Now in Key West, Fla., public health officials are combating a scourge they thought they'd eradicated seven decades ago. Until recently, a locally contracted case of dengue fever had not been seen in Florida since 1934. That suddenly changed in 2009, when doctors in Key West began seeing it in people who had not traveled outside the area. There were 27 cases that year. Last year, 66 people in Key West contracted dengue. Arlo Haskell was one of them. "I had it really bad for three or four days, with a fever of about 103 and the pain in the joints and the eyes," Haskell says. Because of the joint pain, it's sometimes called "break-bone fever." "Typical dengue fever is a severe, flu-like illness," says Mark Whiteside, medical director at the Monroe County Health Department in Key West. While dengue is debilitating, he says it's rarely fatal. "It might last a week or two. You might wish you were dead, but almost everybody gets over it." The carrier of dengue ... is more widespread and abundant than ever before in history. Dengue is considered a serious public health threat in Key West, Hawaii, south Texas and other Florida counties where it has been reported. But compared with its resurgence in Latin America, the outbreak in Key West is relatively minor. The growth in global trade and international travel helped bring dengue to the U.S. But Whiteside says there's another important factor — the Aedes aegypti mosquito. "The carrier of dengue, the vector of dengue — the Aedes aegypti — is more widespread and abundant than ever before in history. That's obviously part of the reason we have dengue back," he says. Last year, health officials in Key West conducted a campaign to educate the public about dengue and about the steps they should take to control mosquitoes around their homes: Dump standing water, use screens and air conditioning, and wear mosquito repellent. So far, the results have not been encouraging. A survey conducted in January found that one 1 of 5 homes in the Keys provided breeding spots for Aedes aegypti. But in Key West, controlling mosquitoes is serious business — too important to be left to volunteers or part-timers. 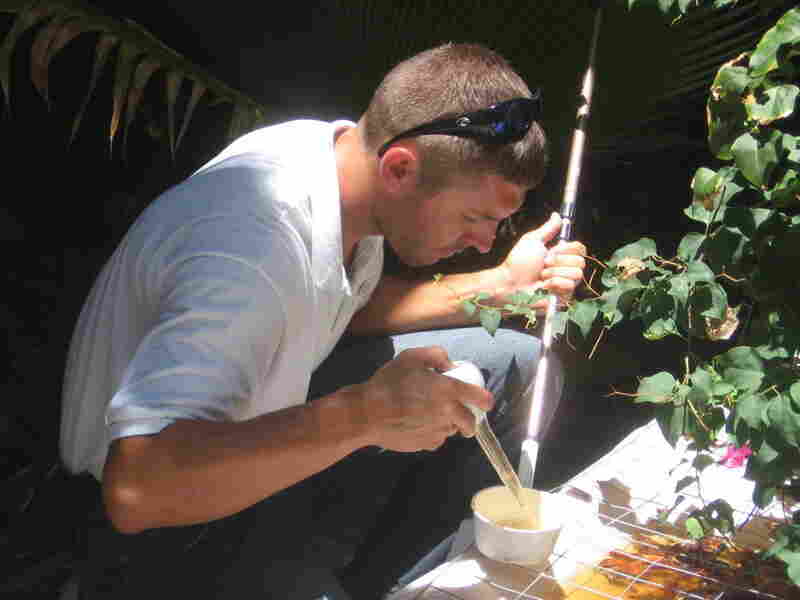 John David Snell inspects stagnant water at a foreclosed Key West home for signs of Aedes aegypti mosquito larvae. The mosquitoes, which transmit the dengue virus, have become more prevalent in the U.S.
John David Snell is an inspector with the local Mosquito Control District. He's one of 23 inspectors who spend every day going house to house throughout Key West, looking for problem spots — unattended pools, open containers, anything that can capture rainwater and provide a place for mosquitoes to lay their eggs. Today he's working in the backyard of a home in Key West's Old Town. In the water of a shallow pond, you can see the tiny — but clearly visible — quarter-inch-long larvae wriggling just under the surface. Dengue is caused by any one of four closely related viruses thought to have originated in monkeys in Africa and Southeast Asia between 100 and 800 years ago. Dengue fever did not become a widespread disease until World War II, when Aedes aegypti mosquitoes were inadvertently transported in cargo. Despite the resurgence of dengue in the U.S., the problem is still relatively minor. There are an estimated 100 million cases worldwide each year. A person becomes infected with dengue after being bitten by a mosquito that has already bitten someone with the virus. The smaller instance of dengue in the U.S. is primarily a result of less frequent contact between people and infected mosquitoes. A person may carry the dengue virus but not show any symptoms. There isn't a specific medication or vaccine for dengue, but the virus is rarely fatal. Snell's methods for combating the mosquitoes vary — he opens his cooler to show one of them. "In here I have the mosquito-eating fish, the Gambusia," Snell says. Snell gently pours the fish — and the brackish water they're in — into the pond. "In a pond this size, 20 fish will probably do the job. And, as long as the fish are happy in here, they'll reproduce," Snell says. "And the population of the fish will get bigger. And, as long as there's water, we don't have to worry about mosquitoes in the pond." Snell's job is part mosquito-cop-on-the-beat and part detective. We walk to a nearby sushi restaurant that closed after a recent fire. Just a day earlier, he said, he remembered the restaurant had a small koi pond inside that he realized he should check on. "And when I opened the door to the restaurant, there was just a swarm of mosquitoes that came out and inside the pond," he says. "They were breeding very heavily." We push inside the burned-out restaurant. Snell says he put larvicide tablets into the pond and fogged the area. The mosquitoes are gone for now. But this is one more location he'll need to check on in the months ahead. The threat of dengue fever has made eliminating the Aedes aegypti a top priority for the Mosquito Control District. But that's easier said than done. Andrea Leal, an entomologist and the Mosquito Control District's deputy director, says Aedes aegypti mosquitoes thrive around people and, in some ways, Key West is an ideal environment for them. "A lot of places here in Key West, they don't have screens. They leave doors wide open. So this particular mosquito, they can breed outside, in let's say a water-holding bucket," Leal says. "And then once the adults come off, they'll move inside the home and feed on people inside the home." The health department and the Mosquito Control District are stepping up efforts to get Key West residents and businesses onboard their campaign to control the mosquitoes that carry dengue. So far this year, there have been no cases reported in Key West. But the rainy season — when mosquitoes peak — is just beginning. Duane Gubler, one of the top experts on dengue fever and other tropical diseases, recently visited Key West. Gubler directs Duke University's Program in Emerging Infectious Diseases in Singapore. In Key West, he says, the stakes involve more than just dengue fever. The Aedes aegypti mosquito is also a disease vector for other tropical diseases that are beginning to show resurgence — including yellow fever. "If we start seeing urban transmission of yellow fever in tropical America, it's going to move very quickly to the United States and to the Asia-Pacific region," Gubler says. "And it will create a global public health emergency if that happens. So, I think the risk of yellow fever is very real." Gubler believes with enough work, it's possible not just to control the Aedes aegypti mosquito but to eradicate it in Key West. After all, he points out, it's an island just 4 miles long and 2 miles wide.